For me growing up, as far as I recall, blue pucks did not exist. As Henry Ford reportedly once said, you can have “any color so long as it is black" and that's what I used for my remarkably unimpressive hockey career. Today, though, there are 4 relatively common colors when it comes to ice hockey pucks. There are the old standard black pucks. Sure, there are marking and non-marking varieties, but they're all black. This is the hockey puck that most associate with the game. There are also white pucks. These are pucks that goaltenders use as a training aid. The whole "harder to see" thing comes in to play. I dunno, goalies are weird. And there are orange pucks too. These are training pucks for players that weigh just under twice as much as a regular black puck. The idea here is that working with a heavier puck makes your stick handling stronger. Odd how as sticks got lighter and lighter, someone came up with an idea to make the puck heavier. Go figure? Neither the white puck or the orange puck are used in games -- they are strictly training aids. But, lastly, there is the blue puck. The blue pucks are the same size as a regular black puck but they weigh 2 ounces less and, boy, does that ever make a difference! From the red line, no less, it was a laser that caught my son Duncan right in the sternum while he was goofing around with Henrik in the crease. Now, in the 40 years prior, I'd never once been able to shoot from the top of the circle with enough power to get a puck to the net without it starting to arc downward. This time, twice as far away, my shot was still trending upward when it knocked him over. Not gonna lie, I felt like a sniper for the first time EVER! And that's the difference a mere two ounces can make. So, blue pucks are what USA Hockey requires youth hockey programs to use for the U8 level of hockey. I believe they even think they should be used part of the time in U10 hockey as well. Similar to how 8U soccer and basketball use a lighter ball, USA Hockey uses a blue puck during 8U games as a standard rule of play. The rule was enacted because of the importance of patiently developing proper techniques at this age. When adults attempt to rush a young athlete’s development, they impair the development of foundational skills. Call me old fashioned but that's ludicrous. Drawing from my own athletic prowess on the soccer field as a kid, I peaked using a size 4 soccer ball. I wasn't Pele or anything but I was a multiple goal per game type of player...until I reached the age where I had to use a size 5 soccer ball. Suddenly things got real with 1-0 scores and, you know, it wasn't really fun for players like me anymore. And with that, I abandoned soccer in favor of distance running. And I'm seeing it now in hockey too. On some of those mite teams, there were kids that could lift those blue pucks very, very early on. Those kids were scoring machines flipped it up over the tiny goalies they faced with ease. In that respect, yes, I will contend that using a lighter puck makes that game more enjoyable for some kids. But those same kids are like me in soccer -- they're peaking at 7 years old and crushed by the hard reality of a black puck a couple of years later. USA Hockey claims that the blue puck allows players to "patiently developing proper techniques" and that "when adults attempt to rush a young athlete’s development, they impair the development of foundational skills." They are 100% backwards in this line of thinking. Blue pucks rush the athletes’ development by making it appear that the players have harder shots and an ability to shoot high when, in reality, they don't. Sure, it makes the meaningless mite games seem more NHL-like, but the fact is, they're inflating the kid's actual abilities. And the techniques they're mostly using are terrible habits that are tough to break. 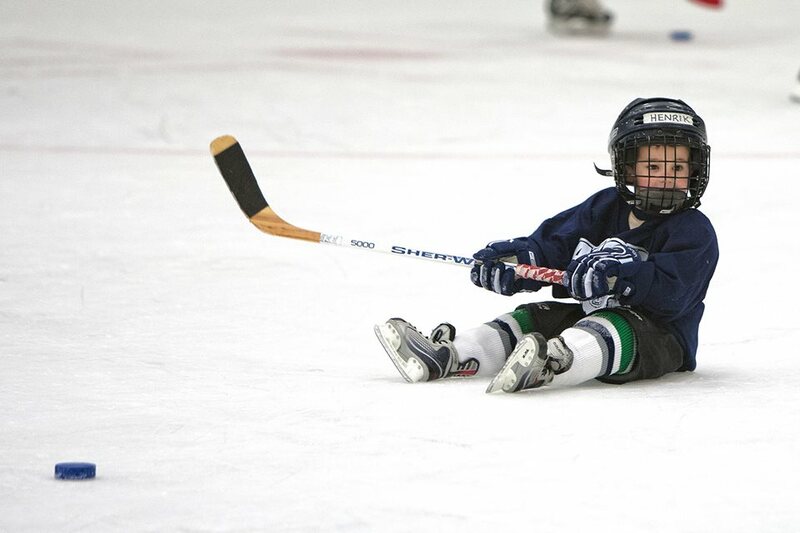 We all see those kids that shovel flip the puck at the net with ZERO power -- they score a lot of goals. That works in mites but not when you get older. A black puck would eliminate that trend and trend kids back to a better technique -- shoot hard, always. Further, to "patiently" develop the proper technique, as they mention, perhaps USA Hockey should be more patient and let the kids appropriately work their way up to lifting the puck...the real puck...so, you know, they can play the real game. Practice the real game using the real equipment. A golfer would never use a racquet ball in the tee box. It'd be absurd for a basketball player to practice using a volleyball and a 12-foot rim, no? As for the half-ice vs. full-ice argument, well, I agree with USA Hockey on that front. I like half ice. Not so much for a competitive game but for scrimmages and things (at any level), it's awesome. As long as it's with a black puck. All of that said, when we practice shooting at home, we use an assortment of blue, black, and orange pucks but when they get a blue one on the shooting pad, it'd better be a bar down snipe every single time. Oh, and for the record, Duncan was fine when I caught him in the chest. I, however, no longer shoot the blue pucks around the kids.